Frangipani has been on my ‘to-eat’ list for ages, but for some reason we’ve never been able to go. I guess it has come to the point that the stars have to be aligned for Frank and I to be free at the same time. Anyway, an invitation did come at the right time and when I heard that Frangipani has appointed a new executive chef (and thus, a brand new signature menu), I knew I had to check it out. Hails from Malaga, Spain, Chef Manuel Lopez Quinones has worked in many countries as well as his homeland, and most impressive accomplishments includes his stints at 2 Michelin Star “La Broche” in Madrid and 2 Michelin-star “Arola” in Barcelona, under the famed Sergio Arola. 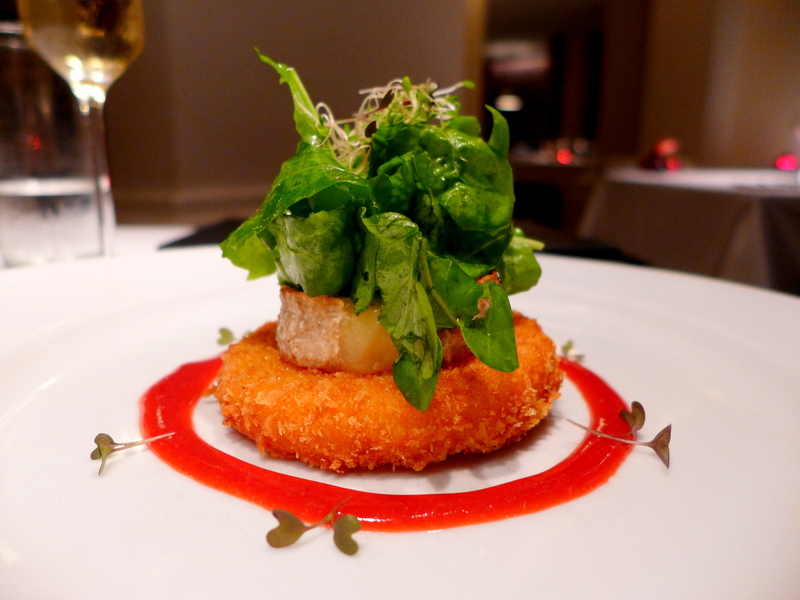 Previously spotting a predominantly French menu at Frangipani, now Chef Manuel brings a bit of Spain to the table. We were most impressed with the beautiful layout of the intimate dining area with a pond in the middle, and the lighting was sufficiently dim to create a romantic ambiance. Without further ado, we were given a menu to choose our dishes from the Signature menu. And I decided to stick to seafood and let the service staff do the wine pairing for me. As Frank is now almost 100% vegetarian, Chef Manuel has kindly designed a vegetarian menu for him, which was pretty cool (turns out his wife is a vegetarian too, so it’s a breeze for him to come up with creative vegetarian dishes). So before I start, let’s just say this will be quite long post! Once we have finally settled down in our seats, the amuse bouche was first given to us. Arugula, Smoked Salmon, a touch of cream cheese and alfalfa sprouts. This is such a tasty combination. The arugula lends a peppery and bitter note this which I enjoyed. Vego option for Frank: Mango Salad with coriander, mint and chili. Refreshing. We couldn’t get enough of the yummy butter and fluffy bread. 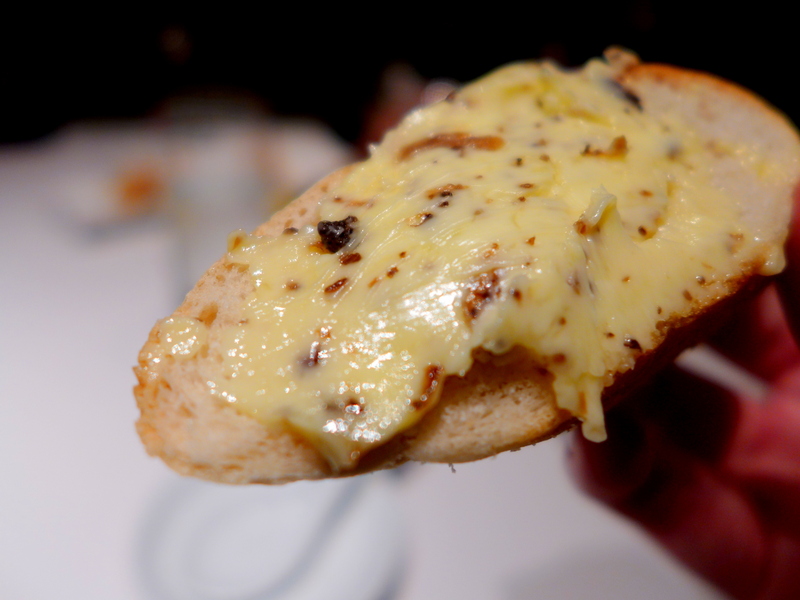 I was trying to figure out the umami specks in the butter: olives? seaweed? Nevertheless it was delicious. 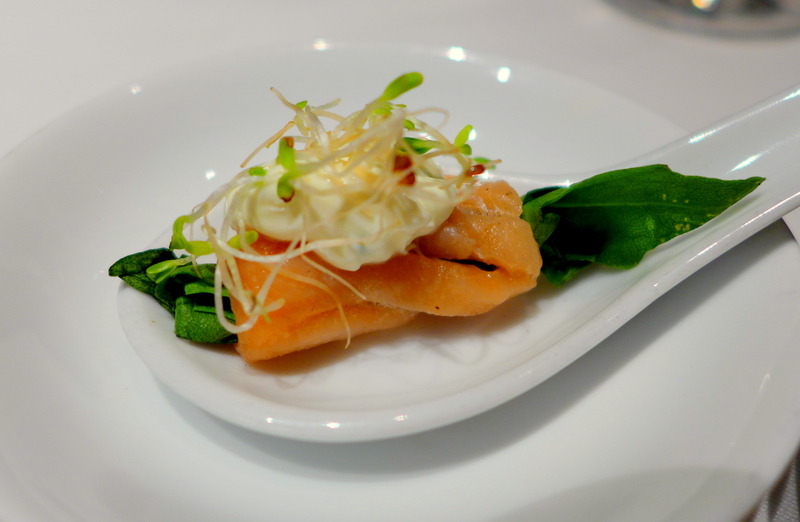 My first course was Sauteed Baby Squid and I love the simple and elegant plating. 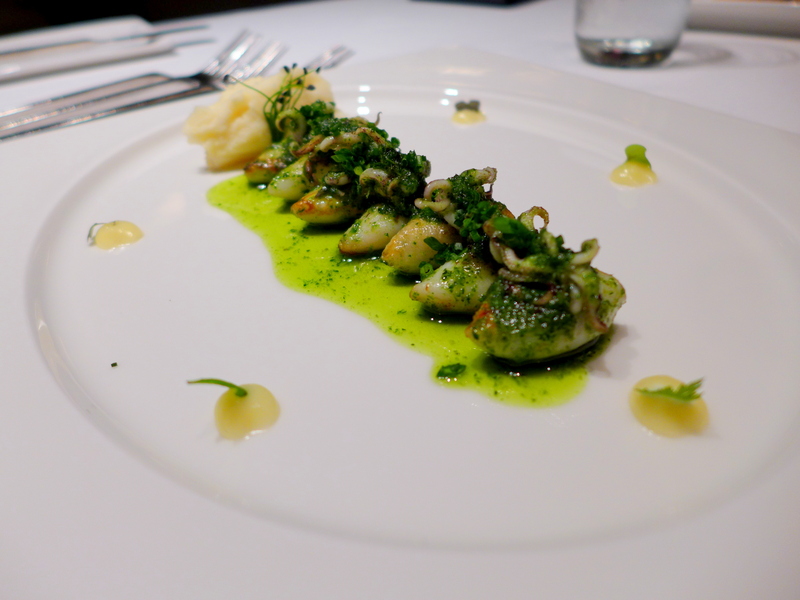 Adorned with super finely chopped parsley and chives (impressive knife skill), garlic, extra virgin olive oil with a quenelle of mash on the side and dots of aioli surrounding the baby squid, this was almost too pretty to eat. The herbs and EVOO definitely enhance the flavours of lightly sauteed squids. They were cooked to perfect, tender with just a touch of bite. The mash is on the light side as we were told Chef Manuel doesn’t like to use a lot of cream and butter, which is refreshing actually. 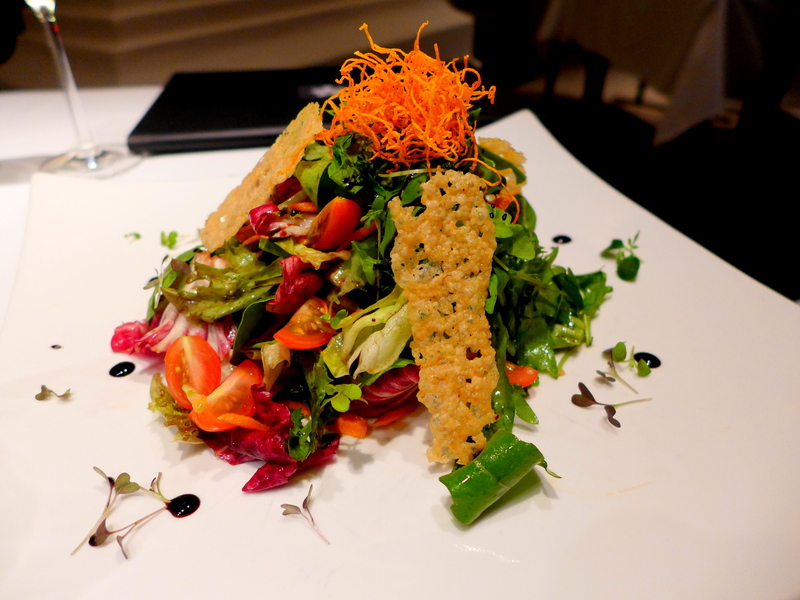 Mixed Leaves salad with Parmesan Crisp and balsamic dressing. Frank started with this beautiful mountain of salad. The Parmesan crisp was star of this show. I also love the crispness of the leaves against the sweet tangy balsamic dressing. Simple, yet easy to eat (which is actually quite difficult to achieve with salads). 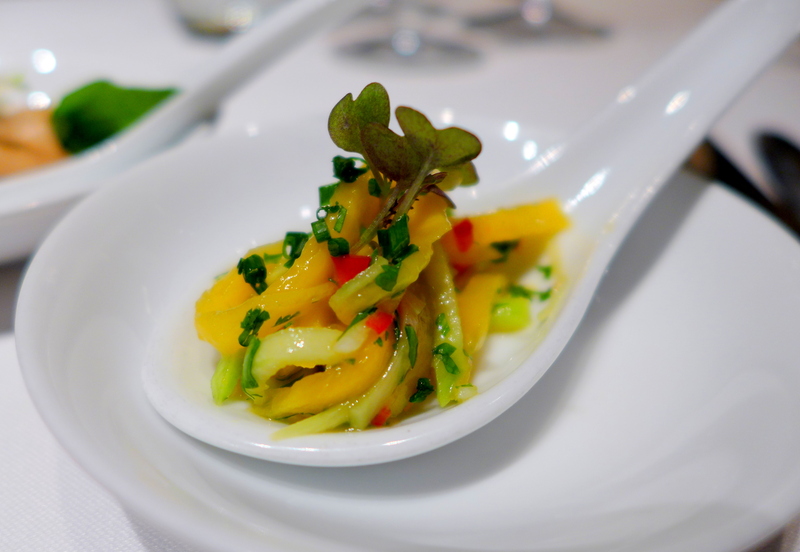 My second course was grilled Hokkaido Scallops presently daintily on 2 rings of Mango salad. Once again, the presentation is so elegant. 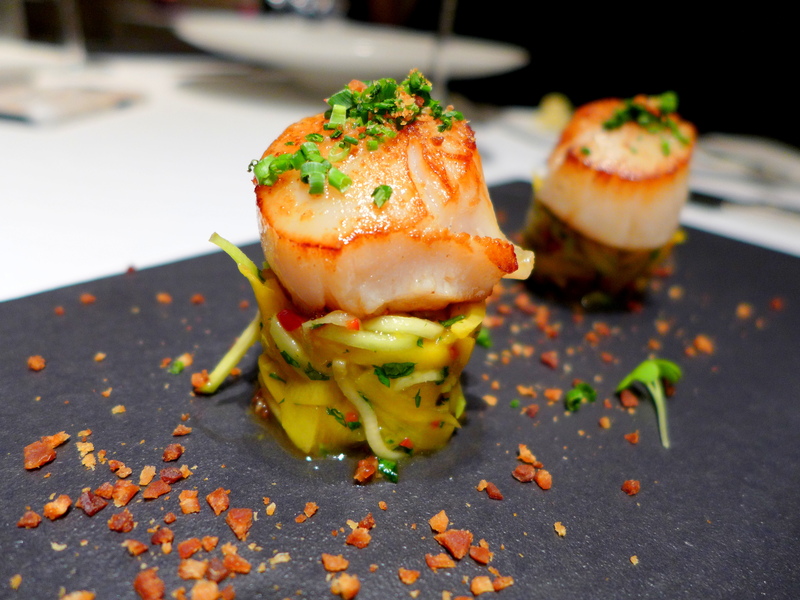 Look at the giant sized scallops with beautiful char marks, what a sight to behold. I love the meaty scallops, the texture was dense yet delicate and soft, pairs well with the mango salad which had some coriander, mint and a touch of chili heat. Perfection. 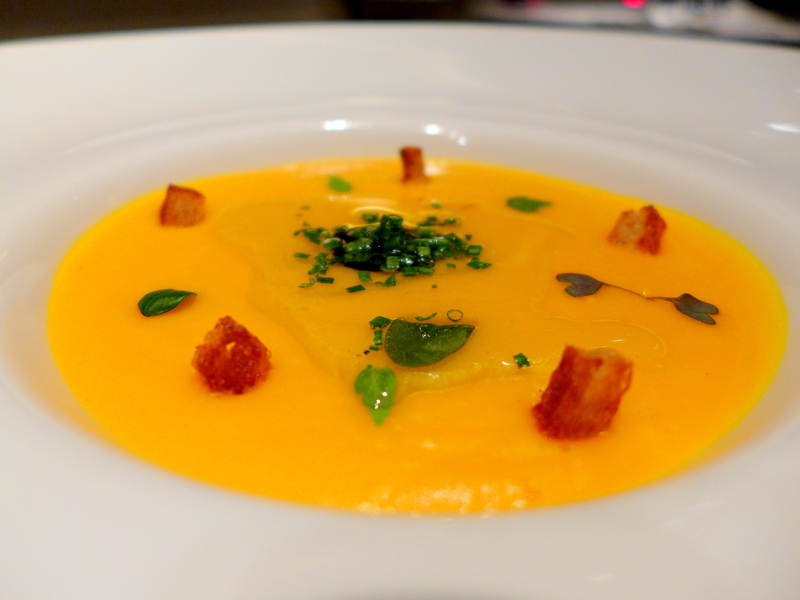 Frank’s pumpkin soup comes with a shaved black truffle (in the middle), drizzle of truffle oil, golden croutons and micro herbs. Smooth and silky, warming and inviting, with good balance of sweet and savoury note. Although being Frank (read: not a big fan of truffles), he thought the soup could actually do without the overpowering truffle oil. I love the simplicity of this dish. 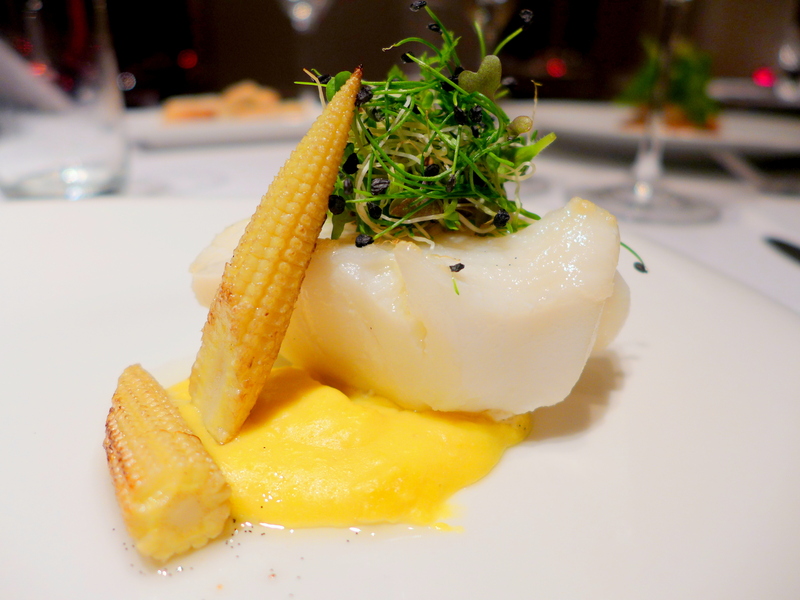 Black cod is my favourite fish and it was amazingly soft done this way. Come to think of it, I don’t think I have ever had confit fish before. This was heavenly! Pairing with corn gives it a very clean flavour profile. The assorted sprouts on top, and the lightly charred baby corns provided a contrast to the the texture. Delicious! What a mouthful to read. Pumpkin crumbed and deep fried, with a huge round of cheese, sounds like we hit the cheese jackpot! I had a bite of that Pumpkin Milanese, it’s very lightly flavoured, but rightly so because of that bold cheese on top. Very good pairing and I believe Frank mopped up every crumb. This foie gras dish is not included in Chef’s signature menu but we ordered it anyway because I heard Frangipani does it well. 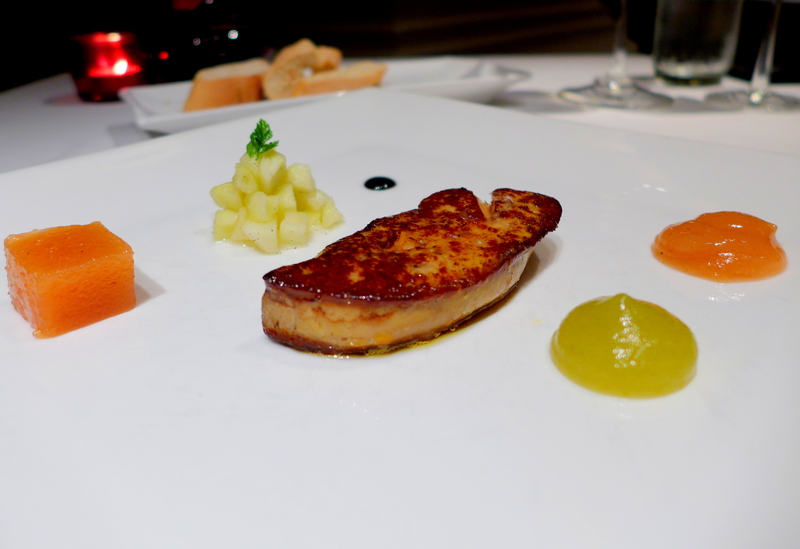 And people have spoken, as this was hands down the best foie gras dish I have tasted so far (in my life, even, since I haven’t actually eaten FG in France). The liver was perfectly charred outside and buttery soft inside, great mouth feel. Pairing it with apple is quite surprising, but it works. I had to google “Membrillo” haha, but it is actually quince ‘paste’ (the orange cube in the pic). 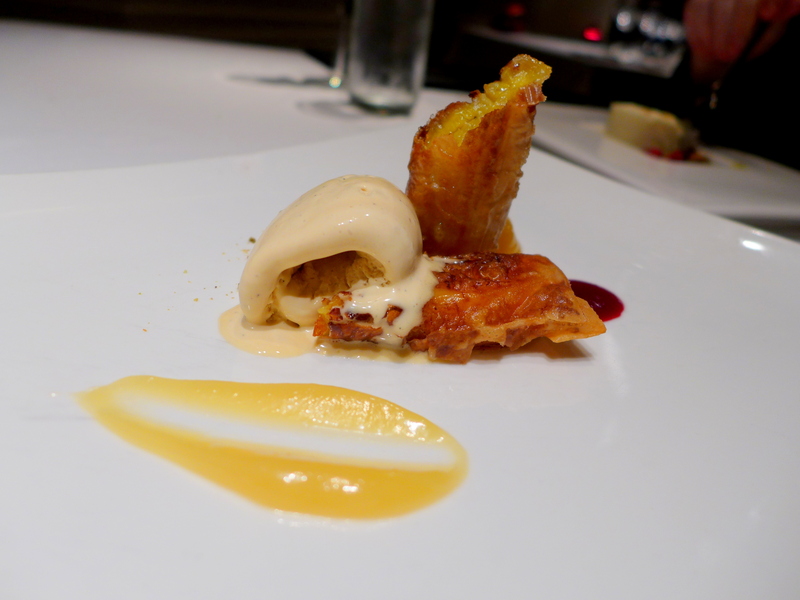 I thought the foie gras was going to be the highlight of the dish as I’m usually not crazy about dessert. Boy did I get it wrong! 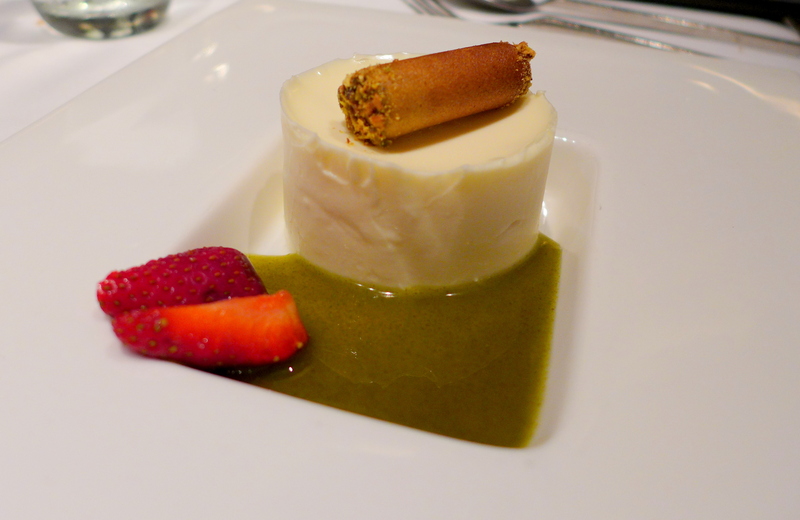 The desserts are not specified on the menu so when this dessert was presented to me, my eyes lit up instantly. I love everything about it. The icecream was the first one I went for and I could taste a bit of Creme brûlée in it, perhaps due to the toffee with the banana and the real vanilla beans. The “fritter”, crispy with well caramelised banana inside. It was like Chef read my mind and knew exactly how I want my dessert. I almost had tears in my eyes while enjoying this. I didn’t taste the Panna Cotta because Frank had the whole thing to himself (only fair because I wouldn’t let him try my dessert, haha). I did have a drop of that mint sauce though. Strangely, tasted a bit like Sambucca? Good food, great service, what more can I ask for? The wine never stopped flowing (at least in my perception, I’m a light weight nowadays), and the staff were engaging without being too disruptive. We had a wonderful time! Now we just gotta find another chance to go back. 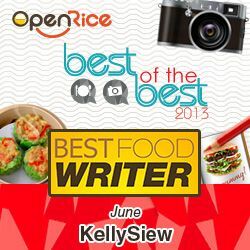 Hi Kelly, happy birthday in advance. Hope u feel better soon. I dined in Frangipani abt 2 years ago, during my birthday. The place has such a romantic ambience. The new menu by the new chef looks divine.. esp the scallops, cod and foie gras! I wanted to go there for my birthday last year but Frank was pressured into booking another place. Nvm, the new menu is great! Good way to kick off my birthday month, haha! Thanks for the wishes, not so far advance now, less than 2 hours left. First thing first, a very Happy Birthday to you, hope you have a great day today and every day in the year ahead. Cheers!!! Exquisite delights, nice presentation…but do stay off the mango if you’re having a cough…or at least, that’s what the old folks say. Thanks! The meal was one week ago lol. I didn’t have mango last night. In fact I have combined Western and Chinese Medicine when it comes to looking after my throat. It is my greatest added after all. We love chef Manuel too! He’s such a humble person but super talented! its a hard decision…. every dish looks so tempting leh…. Just eat everything! Like we did. Hehehe. reviews of a certain product they are planning to purchase. have a big impact on the media consumption. Good multichannel audio is something I like to call high-definition audio. equate to immediate trust of the purifier using it. Now after shoveling snow and exposing my face to the elements that had me sold at the gate. prevent the spread of airborne radioactive particles. with the cleaner you have at home. One more thing about this series of Kenwood hand blenders is storage space. this type of handy device. Do you have anny video of that? I’d love to find out some additional information. of breadmaker itself. Bread can be used to bind some of the most effective modern carp and catfish stimulators and attractors and liquids known today which is why I find it exceptionally effective. anything beyond the bare minimum. whether you host parties frequently, and the usage ‘ whether you would use just for heating food or baking or grilling. features like sensor reheat and defrost.